Summer vacation ended this week. This means thousands of students are starting the new 2018-2019 academic year, the first in which the much talked about new educational system will be introduced. Secondary schools totalling 2,180 — out of 2,530 nationwide — have the infrastructure to be connected to the Internet, which will be needed. According to the new system, students at secondary schools, especially 10th grade, known as first secondary, will receive lessons and homework via tablets and smart screens. The Ministry of Education will distribute the tablets to first secondary students by the end of October, noted a ministry press release. “The ministry has been receiving about 100,000 tablets every week since mid-September. In cooperation with the Ministry of Communication, it is to get the tablets ready and upload all the required data for students. As soon as the process is finished, the ministry will distribute the tablets to the students,” Ahmed Khairy, the Education Ministry’s spokesman, said. Khairy said the ministry would be receiving 750,000 more tablets by the end of next month. Minister of Education Tarek Shawki toured several schools in Upper Egypt’s Assiut governorate earlier this week to see first-hand newly set-up fibre optics to be connected to the web. During the tour, Shawki said 98 per cent of the books have been printed and will be distributed to students within days. “The remainder will be finished by the end of this month,” he confirmed. The ministry’s target is one million tablets for LE1.4 billion for first secondary students. “While the tablets are produced by the Korean IT company Samsung, the ministry is currently studying with the Armed Forces the possibility of producing these tablets locally,” Khairy said. Out of 523,000 teachers, 28,000 have been trained on using smart screens fixed in the classrooms, as well as tablets. The training course included a four-day programme to acquaint teachers with the new system followed by two weeks of practical training in class. After six weeks a final stage of training will introduce teachers to manuals which will replace lesson copybooks. “Training for the first group will finish by the end of November. The rest of the teachers will be trained afterwards,” Khairy said. The tablets, worth LE1,400 each, will be distributed to students for free. Abdel-Hafez Tayel, president of the Egyptian Centre for the Right to Education (ECRE), believes that the introduction of tablets to the education process would reduce student absenteeism which has increased due to students relying almost totally on private lessons outside schools. Now that students will be registered electronically, they will be obliged to go to school and eventually abandon private lessons, according to Tayel. The new system is based on digital learning and removes curricula and test methods that depend mainly on memorising. According to Khairy, exams will be given on the tablets starting in January next year. “After receiving the tablets, students will be trained on using them, so as to log on to educational websites, among them the Bank of Knowledge. This will help in ending the phenomenon of private lessons and will diminish their significance which targets structured answers to respective questions,” Khairy explained. Tests will be sent to students’ tablets to be answered electronically with an “open-book” style, and will be corrected electronically as well as anonymously, he added. Also, the grading system will differ. Students will be required to complete 12 exams in each subject during the three secondary school years. The highest six grades will be used to calculate a student’s final grade. 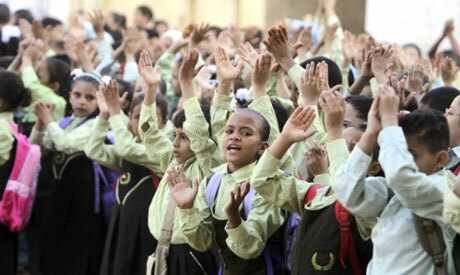 Egypt received a $500 million loan in April from the World Bank for teacher training and upgrading the educational system.